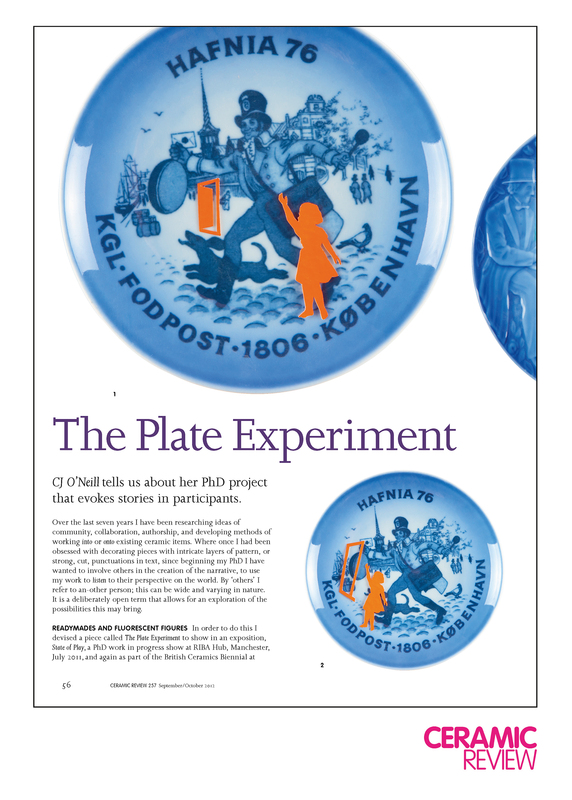 A commissioned article for Ceramic Review Issue 257 2012 about The Plate Experiment. CJ O’Neill tells us about her PhD project that evokes stories in participants. READYMADES AND FLUORESCENT FIGURES In order to do this I devised a piece called The Plate Experiment to show in an exposition, State of Play, a PhD work in progress show at RIBA Hub, Manchester, July 2011, and again as part of the British Ceramics Biennial at Spode, Stoke-on-Trent. 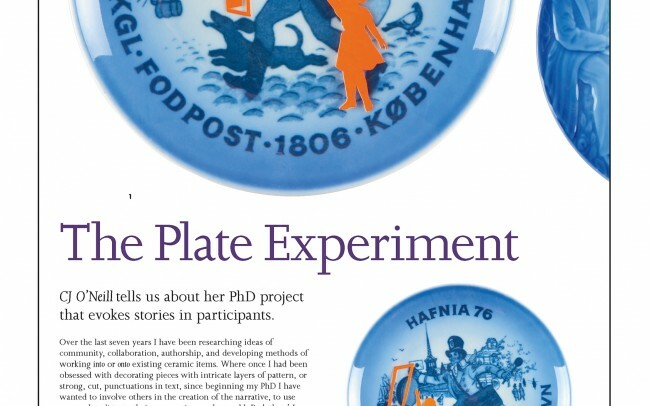 For The Plate Experiment I selected a range of plates gathered from charity shops and flea markets that already contained a high level of surface narrative. I began to play with highlighting characters from within the surface pattern, producing silhouettes of these in hand-cut fluorescent orange card. I enjoy the combination of industrial, man-made materials with processes of the hand; the juxtaposition of the two elements set up a counterpoint. Silhouettes of doorways had emerged during my involvement in The Pol Project, a month long collaborative project in Dhal ni Pol, Ahmedabad, India in 2010. (www.thepolproject.blogspot.com) acting in most instances as a visual portal, entry point, or escape route. The basic premise of The Plate Experiment was a simple set up of camera over a cutting mat with a range of plates and hand-cut characters/doorways laid out for participants to use. 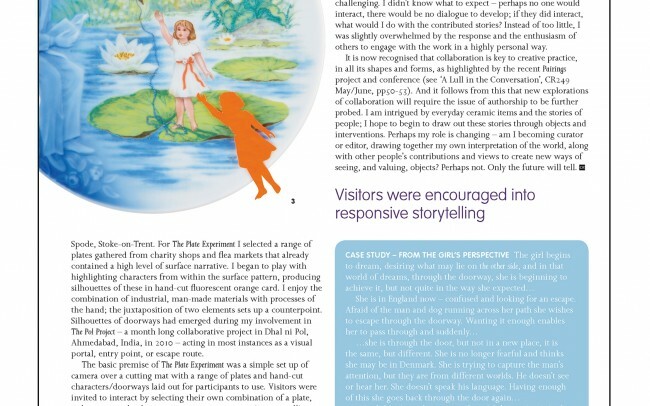 Visitors were invited to interact by selecting their own combination of a plate, a character, and a doorway, to encourage responsive storytelling. Participants were invited to create a scene with the materials and then write a short statement about the story they imagined; each story was separate and people didn’t see the others’ stories. AUTHORSHIP My subsequent processing of this information unexpectedly highlighted issues around authorship. Whose work is this? How are the others I invited to be involved in this process actually acknowledged? The piece presented below cites a number of authors, and is one way of addressing this issue. It is crafted by me from the combined contributions made during The Plate Experiment at State of Play by Helen Felcey, Pui Lee, CJ O’Neill, Sonia Sanchez-Lopez, and Sylvianne Sykes. SHARED TECHNIQUES On reflection I see that the process of creating this narrative is the same process that I use when constructing a ceramic piece, working with layers and symbols to create a thread, a connection, between disparate parts. Inviting others into this process has been enlightening, liberating, and challenging. I didn’t know what to expect – perhaps no one would interact, there would be no dialogue to develop; if they did interact, what would I do with the contributed stories? Instead of too little, I was slightly overwhelmed by the response and the enthusiasm of others to engage with the work in a highly personal way. It is now recognised that collaboration is key to creative practice, in all its shapes and forms as highlighted by the recent Pairings project and conference (www.miriad.mmu.ac.uk/pairings/). And it follows from this that new explorations of collaboration will require the issue of authorship to be further probed. I am intrigued by everyday ceramic items and the stories of people; I hope to begin to draw out these stories through objects and interventions. Perhaps my role is changing – am I becoming curator or editor, drawing together my own interpretation of the world, along with other people’s contributions and views to create new ways of seeing, and valuing, objects? Perhaps not. Only the future will tell. 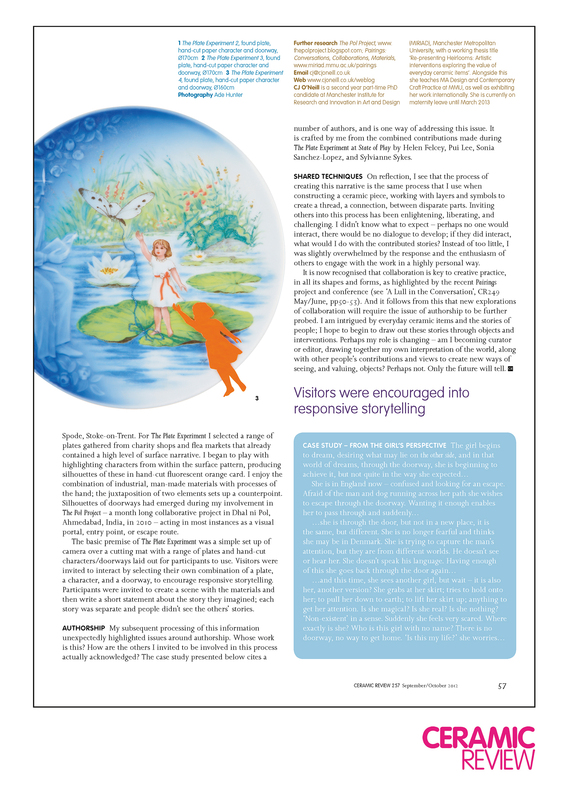 Article originally published in Issue 257 of Ceramic Review.